Last week we published our annual list of resorts where seniors can ski free. For the first time, we added the results of our survey of all Canadian ski areas. Several readers notified us of areas with free skiing privileges that we had overlooked. They include Arizona Snow Bowl (AZ), Boreal (CA), Loveland (CO), Bellayre (NY), and Cataloochee (NC). Catalooche requires you to be 65. The others, 70. 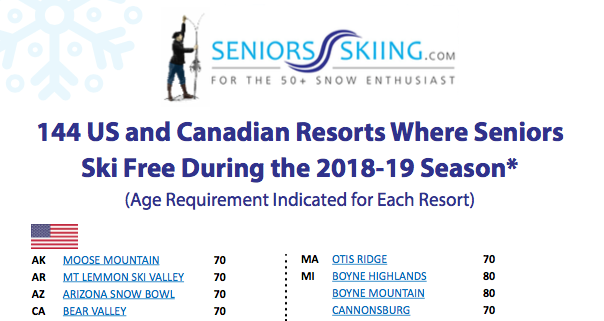 The list now totals 144 places in North America where seniors can ski free (or almost free). To find the list, click “Community,” then “Subscriber Only Content,” then “Free Skiing For Seniors.” Or take a shortcut by clicking here. We encourage all readers to submit the names of other areas offering free skiing to seniors or the season passes for $125 or less or day tickets for $25 or less. Many thanks to the readers who sent in updates. Thanks for the info, Deb. We’re adding to the list. Correction on your list. Belleayre charges $20 for 70+. Used to be free but not for years, Also Sugarbush in VT. Has a 70+ Boomer Midweek Pass which I bought for $126 with tax last Spring. Will be more now. Loveland in CO. Charges $99 for 70+ Season Pass. Thanks Carol. Our definition of free also includes Almost Free. $20 is a pretty steep discount, no? Same with Sugarbush. Boreal Ridge in California does not fit your criteria for inclusion in this list. I would suggest removing it. Super Senior ($70+) is $69 for a season pass. Our criteria is anything around $25 for a lift ticket or less than $125 for a season pass qualifies as “almost free” as specified in our article.